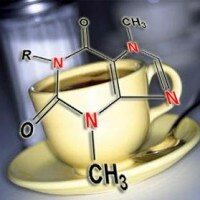 Most doctors recommend limiting caffeine during pregnancy to 300mg per dag. The table below gives a guide to caffeine levels in popular drinks. The occasional caffeinated beverage is not harmful to the baby, because only a very small part goes ito the milk. 1 or 2 cups of coffee a day is a safe limit. If you take more than 750 mg of caffeine a day, the amount of caffeine in the baby's body will accumulate, especially in newborn babies. It costs a baby about 2 to 5 days to excrete half of the caffeine. If the baby is 3 months old, he can do this in 14 hours. Many shops sell herbal teas and drinks to replace caffeinated beverages during pregnancy, but make sure these have been tested first. If in doubt, consult your doctor.